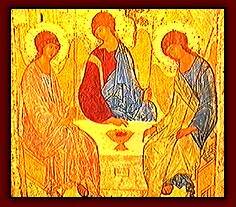 The Orthodox Church provided a sense of unity for the people and inspiration for creative artists. A little north of Moscow, St. Sergius founded the Holy Trinity-St. Sergius Monastery, which became a great religious and cultural center. One of the most important Russian icons, Andrei Rublevs Old Testament Trinity, was commissioned to hang above the tomb of St. Sergius. Of all the great icons that speak to the mind and heart of the Russian people, none does so more powerfully and more beautifully than this great icon of Andrei Rublev, which represents the Holy Trinity,James Billington.